Methicillin-resistant Staphylococcus aureus (MRSA) is an important cause of infections in humans. 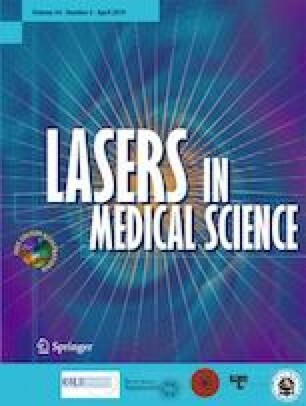 Photodynamic therapy using blue light (450 nm) could possibly be used to reduce MRSA on different human tissue surfaces without killing the human cells. It could be less harmful than 300–400 nm light or common disinfectants. We applied blue light ± riboflavin (RF) to MRSA and keratinocytes, in an in vitro liquid layer model, and compared the effect to elimination using common disinfection fluids. MRSA dilutions (8 × 105/mL) in wells were exposed to blue light (450 nm) ± RF at four separate doses (15, 30, 56, and 84 J/cm2). Treated samples were cultivated on blood agar plates and the colony forming units (CFU) determined. Adherent human cells were cultivated (1 × 104/mL) and treated in the same way. The cell activity was then measured by Cell Titer Blue assay after 24- and 48-h growth. The tested disinfectants were chlorhexidine and hydrogen peroxide. Blue light alone (84 J/cm2) eliminated 70% of MRSA. This dose and riboflavin eradicated 99–100% of MRSA. Keratinocytes were not affected by blue light alone at any dose. A dose of 30 J/cm2 in riboflavin solution inactivated keratinocytes completely. Disinfectants inactivated all cells. Blue light alone at 450 nm can eliminate MRSA without inactivation of human keratinocytes. Hence, a high dose of blue light could perhaps be used to treat bacterial infections without loss of human skin cells. Photodynamic therapy using riboflavin and blue light should be explored further as it may perhaps be possible to exploit in treatment of skin diseases associated with keratinocyte hyperproliferation. Methicillin-resistant Staphylococcus aureus (MRSA) is one of the most important bacterial pathogens associated with morbidity and mortality [1, 2]. The development of new pharmacological agents is a complicated and slow process, with antibiotic resistance emerging as an increasing problem. Several approaches have been proposed to maintain the efficacy of currently available antimicrobials. These include educational efforts to reduce unnecessary prescription as well as infrastructural strategies to improve sanitation and limit spread of drug-resistant microorganisms. Furthermore, vaccines, probiotics, and more non-specific antimicrobials have been suggested as possible therapeutic strategies against infections [3, 4, 5]. Photodynamic therapy (PDT) or Photodynamic Antimicrobial Chemotherapy (PACT) is a mode of treatment which has been considered for local infections, and evaluated through in vitro and in vivo experiments [6, 7]. Excitation of a photosensitizer by light illumination generates reactive oxygen species (ROS) which results in pathogen elimination [8, 9, 10]. However, blue light (400–470 nm) can eliminate both Gram-positive and Gram-negative bacteria without chromophores [8, 11] and is considered to be less harmful to human cells compared to UV irradiation [8, 12]. It is believed that endogenous intracellular porphyrins are excited by blue light irradiation which functions as photosensitizers [13, 14]. Wavelengths between 402 and 420 nm are seemingly more effective than longer wavelength of blue light (455 and 470 nm) although the longer wavelengths may have some advantages in elimination of dense bacterial cultures with high colony forming unit (CFU) counts [15, 16, 17, 18, 19]. Blue light in the lower wavelength spectrum (400–425 nm) can be utilized to treat acne vulgaris with few side-effects reported [20, 21, 22]. Riboflavin (RF) (vitamin B2) is a non-toxic photosensitizer that can be used together with UV irradiation of blood components in order to eliminate microorganisms [23, 24, 25, 26]. Combined with ultraviolet light A, it is also clinically used in the treatment of corneal ectasia, such as keratokonus and has been evaluated in management of recalcitrant corneal infections . We have previously investigated eradication of MRSA in vitro, mediated by riboflavin photoactivated using ultraviolet light A (365 nm) [28, 29, 30] and blue light (412 nm and 450 nm)  in thin layers of fluid (0.4–1.76 mm). In these experiments, the elimination of blue light was augmented by the presence of riboflavin, and a relatively low dose was required to eliminate MRSA in a thin fluid-layer with the photosensitizer. In a thicker fluid-layer (1.17 mm), with higher number of bacteria, the effect (of 412 nm) was reduced (91% with riboflavin), which is consistent with other publications [18, 19] but the longer wavelength (450 nm) was not evaluated under these conditions. It is possible that light with wavelength 450 nm is advantageous compared to 412 nm and could cause less damage to human cells but still be useful for inactivation of microorganisms. A higher dose of 450 nm would likely be required to mediate an antimicrobial effect in a thicker fluid layer and the impact on human cells must also be evaluated if this method should be considered for any in vivo application. We therefore aimed to determine the effect of higher doses (≥ 30 J/cm2) of blue light (450 nm) in a 1.2 mm fluid layer, with and without riboflavin for eradicating MRSA. Similarly, exposure was done on human keratinocytes as an indicator of effects of these dosages on human epithelial cells. A prototype diode lamp (TERUMO.BCT, Lakewood, Colorado, USA) was used for irradiation, (Total Power Output = 7.14 W, peak wavelength = 450 nm) with three parallel light-emitting diodes (LedEngin, Inc., CA, USA) in a row spanning over 4.5 cm, without light collimation, inside a square illumination box. Calibration was conducted prior to the experiments, on six different representative locations inside the illumination chamber to control adequate exposure of all wells (308 UV-intensity meter, OAI, CA, USA, 436 nm detector 308-0002-11). The defined irradiance was a mean of these six measurements. Bacterial and keratinocyte suspensions were treated with four different doses of 450 nm as measured at the fluid level in the experiment. Dose 1, 15 J/cm2 (irradiance = 25 mW/cm2, time = 10 min). Dose 2, 30 J/cm2 (irradiance = 25 mW/cm2, time = 20 min. Dose 3, 56 J/cm2, (irradiance = 46.6 mW/cm2, time = 20 min). Dose 4, 84 J/cm2 (irradiance = 46.6 mW/cm2, time = 30 min). The distance to the LED-lamps was 13 cm for the two lower doses and 9 cm for the higher light exposure. The exposed area evaluated during illumination was 16.25 cm2. Staphylococcus aureus resistant to methicillin and oxacillin (MRSA) (American Type Culture Collection (ATCC) no. 43300), stored at − 80 °C and cultured at 37 °C, was obtained from colonies on blood agar plates. The bacteria were counted in a Bürker Chamber and diluted in sterile phosphate buffered saline (PBS) (no: 14190-094, Gibco by Life Technologies, Life Technologies Corp., Paisley,UK) to approximately 4 × 106 CFU/mL. Further dilution was made using cell culture medium (RPMI, Gibco no: 11835-063) with and without addition of riboflavin (RF), final concentration in suspensions 0.01% (no. R7649-25G, SIGMA-Aldrich, Schnelldorf, Germany). The estimated CFU/mL concentration in solutions was 8 × 105 CFU/mL at the start of experiments. Bacterial mixtures were placed in specific wells (n = 3) on cell culture plates (40 μL per well, 6.5 mm diameter, fluid thickness 1.2 mm) (Sarstedt 96 well plate, no: 83.3924.500, SARSTEDT AG & Co., Numbrecht, Germany) positioned directly below light source to allow exposure of the entire well. One plate was illuminated with 450 nm; the other was kept distanced in darkness within the same room during the exposure time to avoid photosensitization from lamp as well as from background light. A sample (10 μL) was taken from each well and plate after treatment, diluted with PBS and 50 μL of this dilution was spread with Z-rod on blood agar plates. The blood agar plates were cultured overnight at 37 °C. Colonies were counted manually and the number colony forming units (CFU) was determined. The complete experiments were repeated two or three times. Most CFU counts were controlled by two independent examiners. In order to facilitate comparisons with results from our previous study with blue light evaluation , a modified thin layer-model was also used as previously described . By using 20 μL volume of bacterial dispersion, forming a 0.5 mm layer on adhesive sterile preparation glass wells, evaluation of MRSA elimination in fluid films was conducted twice. Light exposure with 450 nm was done (irradiance 25 mW/cm2, 13 cm from LED) with and without presence of RF (0.01%) at doses of 10, 15, and 30 J/cm2. Samples of 5 μL were withdrawn from the wells (n = 4) for CFU-determination. A different source of riboflavin was used in these experiments (sterile 500 μM riboflavin in 0.9% NaCl, (Terumo BCT, USA). Dilution in RPMI was done to reach a riboflavin concentration of 0.01%. Immortalized human keratinocytes (HaCat) (no. 300493, Cell Lines Service (CLS) GmbH, Eppelheim, Germany) from stocks in liquid nitrogen, were cultivated (37 °C, 5% CO2) (DMEM, Gibco no. 61965-026), with 10% fetal bovine serum (Gibco, no. 10270) and 0.1% gentamicin (Gibco, no. 15710-049) using a T-75-bottle (Sarstedt, no: 833911002). 70–80% confluent cells were trypsinated (Sigma, no. T 3924) and diluted in cell culture medium with a concentration of approximately 50,000 cells/mL (passages 12, 14, and 16 at the time for the experiment). The cell solution (100 μL) was placed in each of the six wells in the center of two cell culture plates (Sarstedt 96 well, no. 83.3924.500). After 2 days of incubation, there were approximately 1 × 104 viable cells in every well and the experiments were performed. For every experiment, the cell culture medium was removed from the wells and replaced with (sterile) 40 μL RPMI, ±RF (0.01%) (SIGMA, no. R 7649-25G). One of the plates was exposed to 450 nm and the other was kept under dark conditions during the exposure time, in the same room as the exposed solutions. After, the irradiation solutions in all wells were removed and the cells were washed once with 100 μL cell culture medium. The measurement of cell activity after incubation for 24 h and 48 h was performed as separate experiments. Cell Titer-Blue mixture (CTB, no. G808A, Promega Biotech AB, Sweden) (20 μL) was added to the 100 μL medium above the keratinocyte cell layer on the plates. These were then incubated for 2 h (37 °C, 5% CO2) to assess keratinocyte ability to break down the blue pigment (resazurin) into a fluorescent end product (resorufin). The mixture in the wells (100 μL) was removed to a black-walled reading plate (no. 655090, Greiner bio-one GmbH, Frickenhausen, Germany) and relative fluorescence was measured in FLUO star OPTIMA) (excitation at 544 nm and emission at 590 nm), using the supplied software (BMG Lab technologies BmbH, Offenburg, Germany). This was repeated for all doses and controls in the experiment. The results were compared to negative controls (CTB and cell culture medium and/or cell culture medium only), and corrected for background signal. These experiments were repeated in full three times during three different weeks. To evaluate skin surface disinfection fluids’ effect on MRSA compared to blue light exposure, bacterial solutions (40 μL) (estimated 8 × 105 bacteria /mL in RPMI) without RF were mixed with equal amount of disinfectant; hydrogen peroxide 3% (HPO) (no. 331926, Apotek produktion & laboratorier AB, Sweden) or chlorhexidine 0.5 mg/mL (CHX) (no. 549550, Fresenius Kabi AB, Sweden). A desiccating skin wash solution, aluminum acetotartrate solution 10 mg/mL (Alsol) (no. 207634, Apoteket AB, Sweden), was also tested. After incubation of the plates in darkness for 1, 2, 5, 10, and 15 min, 10 μL was removed from each well and CFU was established as described before. The results were compared to the start concentration of control wells. Surface disinfection solutions were also evaluated on keratinocytes. After preparation and incubation of HaCat cells, as specified above, the cell culture medium was removed from the wells on two separate plates. Subsequently, 40 μL of RPMI was mixed with the same volume of epidermal washing fluid (the three types specified above) and added to the wells. Incubation was done for 1, 2, 5, 10, 15, and 20 min. The suspensions were removed, the keratinocytes washed once with 100 μl cell culture medium, and incubated for 48 h. Cell viability was measured as described previously. Values were expressed as means ± standard deviations. Relevant comparisons of ratios were analyzed using the non-parametric Mann-Whitney U-test (two-tailed) for independent samples without the assumption of normal distribution. Calculations made by using IBM® SPSS® Statistics 22.0 for Windows (IBM Corp., Armonk, NY, USA) were used for analysis and p values below 0.05 were considered statistically significant. Elimination of MRSA by blue light was, at all dosages, potentiated by the presence of riboflavin (RF) (Fig. 1). At lower irradiation settings (15 J/cm2 and 30 J/cm2), light alone did not decrease the number of bacteria in suspension significantly. 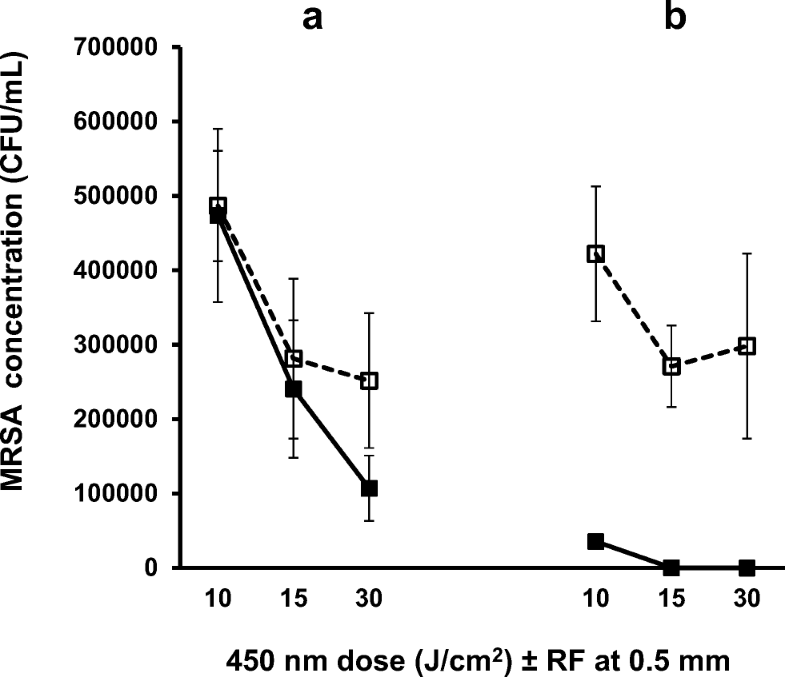 Blue light exposure together with riboflavin (+ RF) reduced the mean number of CFU significantly (p value ranging between < 0.001 and 0.009) at all dosages compared to non-illuminated solutions (− RF). The elimination of MRSA was more pronounced at higher light dosage, with 57% reduction at dose 1, reaching 99.5% at dose 4. Riboflavin without illumination exposure did not influence growth of bacteria significantly. Blue light exposure without a photosensitizer led to a statistically significant decrease of bacteria compared to controls, only at the two higher evaluated levels (dose 3 and 4), with 41% (p = 0.012), and 71% reduction (p = 0.006), respectively (Fig. 1). The difference in bacterial elimination between blue light with and without RF (0.01%) at the highest exposure level (84 J/cm2) was statistically significant (p = 0.004). Irradiation of MRSA using blue light with riboflavin (+ RF) in the thinner fluid layer (0.5 mm) required a dose of 30 J/cm2 for complete eradication (Fig. 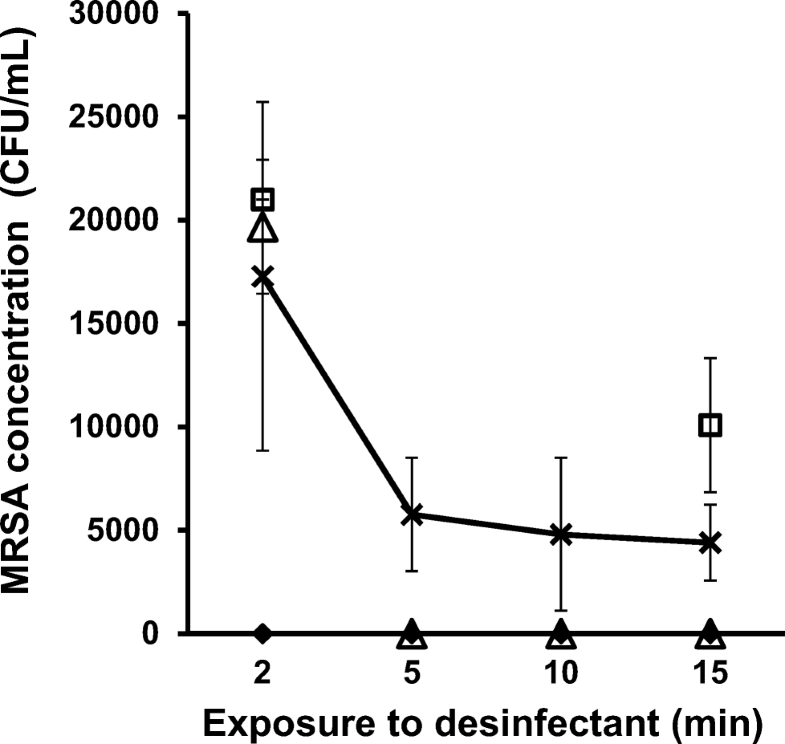 2) and the same exposure dose alone (− RF) reduced MRSA in fluid by 50% (p = 0.007). Keratinocytes exposed to blue light solitarily were not affected significantly at any tested dose, as detected by CTB-assay after 24 h (not shown) and 48 h (Fig. 3). Irradiation of cells in the presence of riboflavin resulted in a nearly complete inactivation at a dose of 30 J/cm2 and above after 48 h.
The control experiments showed that the two disinfectants eradicated all MRSA after 5 min, however, the aluminum acetotartrate wash solution (Alsol) reduced the CFU number in solutions but did not eliminate all bacteria, even after 15 min of incubation (Fig. 4). All disinfectant resulted in complete keratinocyte inactivation, in CTB measurement and took place within 2 min after exposure (Fig. 5). The 24-h measurements as well as extended viability measurements are not shown. 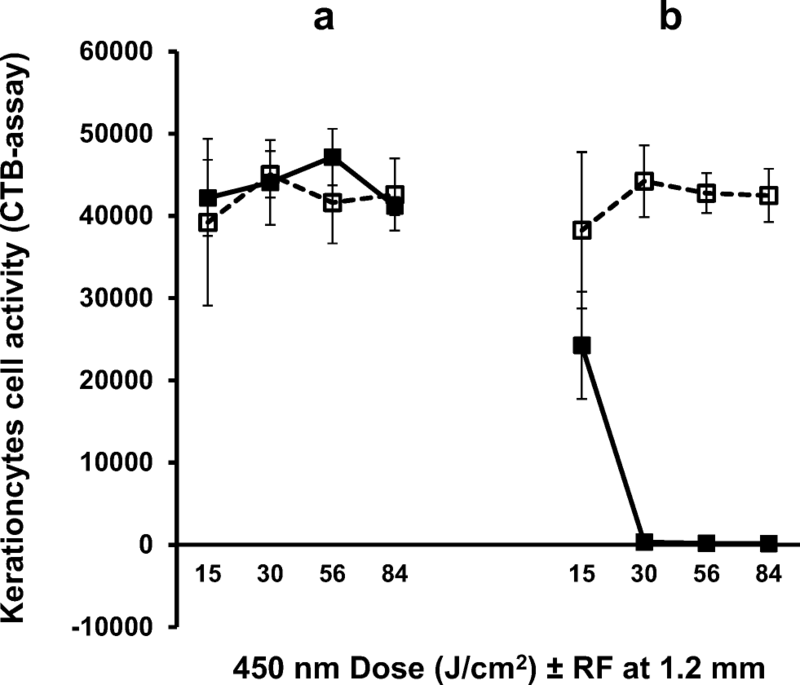 Blue light alone at 450 nm (84 J/cm2) reduced the number of MRSA by approximately 70% without inactivation of human keratinocytes in the 1.2-mm fluid layer. Higher exposure doses would likely result in a more extensive elimination of bacteria, as seen by the trend in elimination. The effect would probably be higher in a thinner fluid layer, as seen by the 50% reduction using 30 J/cm2, which in the 1.2-mm layer would correspond to the blue light effect of 56 J/cm2 (53% reduction) (Fig. 1). Our results are in line with several other studies evaluating the antimicrobial effect of blue light on MRSA [15, 16, 18, 19, 22, 32]. Previous experimental studies have shown more or less efficient elimination but it is difficult to make direct comparisons of efficacy between these due to methodological differences. Several publications have evaluated effects on MRSA exposed on agar plates directly but some advantages with our model, using bacterial suspensions, is that it facilitates an exact control of photosensitizer concentration in the fluid as well as assessment of reduction in bacterial number. However, several aspects involved need to be investigated to more completely elucidate underlying mechanisms mediating the riboflavin-mediated photodynamic cell inactivation. Some of these are study of bacterial biofilms, intracellular mechanism, and measurement of ROS-levels induced by the photodynamic treatment. Keratinocytes were not affected by blue light exposure alone, at any dose evaluated. However, illumination in combination with riboflavin inactivated these cells already at a dose of 30 J/cm2. Hence, human keratinocytes in these experiments responded differently than bacterial cells towards the photooxidative stress generated by riboflavin photosensitization compared to blue light exposure alone. Perhaps the dissimilar outcome can in part be explained by differences in method used for evaluation (HaCat adherent cells and MRSA in suspension) and the number of cells in suspensions. Moreover, the assay used for cell activity examines only one aspect of cellular life processes and the effects were only followed 48 h after illumination. The immediate effect was however clearly different between bacteria and the immortalized human cell line. Since the photodynamic approach, using blue light and riboflavin, as well as disinfectants influenced keratinocytes strongly, the former could be advantageous in certain situations in which a more selective antimicrobial effect is desired. Some examples are elimination of bacteria in biofilms, mucus membranes, and on skin wounds without affecting human cells detrimentally. Light exposure can be controlled; however, loss of keratinocytes in vivo is to be expected in possible treatment of a skin or wound infection. 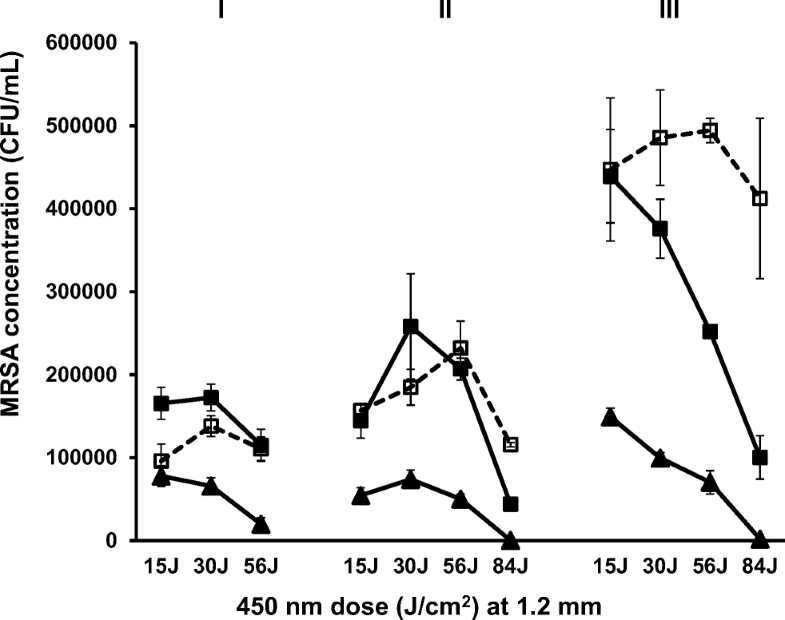 Other publications have reported keratinocyte cytotoxicity in vitro after blue light with wavelengths between 412 and 426 nm at dosages between 66 and 100 J/cm2 with reported cytotoxicity limit for 453 nm light at considerably higher levels [22, 33]. In these experiments, we showed that riboflavin enhances the antibacterial efficacy of blue light exposure. The highest evaluated dose (84 J/cm2) of 450-nm light with riboflavin in 1.2 mm thickness resulted in a nearly complete elimination of bacteria. As expected, the effect increased with higher light dosage and was at all dosages superior in the presence of riboflavin. However, a greater light dose was needed for elimination compared to 412 nm light, which was studied in our previous study with MRSA using a similar fluid layer thickness . These results indicate that more light intensity or exposure time is required using 450 nm than for 412 nm light. Based on previous experiments, we decided only to evaluate one riboflavin concentration, since only a low quantity of the photosensitizer is required for pathogen elimination [28, 30]. However, it is possible that increased dose exposure would perhaps require higher concentration for optimized elimination. Hence, further studies on blue light-mediated photodynamic inactivation of microorganisms with different irradiation settings and pathogens are warranted. However, the results may at least in part be a consequence of the fact that the mean bacterial concentration was roughly ten times higher in the current experiments compared to our previous study. In other aspects, the experimental settings were almost identical. Since the effect of riboflavin photosensitization was relatively distinct, and seemingly more pronounced than in MRSA, it is possible that photodynamic therapy by blue light and riboflavin is possible to exploit for treatment of skin conditions associated with hyperproliferative keratinocytes such as psoriasis  or atopic dermatitis . Riboflavin is from many perspectives an ideal photosensitizer, given that it is present in human cells, with non-toxic degradation products and already clinically applicable in photodynamic use of human tissue. Riboflavin-mediated pathogen eradication of blood products is already currently used in blood transfusions and riboflavin is tolerated in high dosages for prevention of migraines in human without any indications of toxicity . One example of the documented in vivo implementation photochemical effect of riboflavin is corneal crosslinking (CXL) [37, 38] for treatment of keratoconus and other corneal ectasia. Since shortwave ultraviolet light (UVB) is hazardous to genetic material and could potentially be carcinogenic , blue light applied as a photodynamic treatment could be preferable to phototherapy using UVB. Another possible advantage of combining phototherapy with a photosensitizer, if applied similarly as in ocular use, is the control of exposed area given that riboflavin is needed for the photodynamic effect. Recently, photodynamic therapy was proposed for treatment of psoriasis [40, 41] but, to our knowledge, this is the first study that has suggested a possible use for riboflavin photoactivation for the condition. The control experiments using surface disinfection fluids on MRSA showed expected results, with regard to antimicrobial efficacy. However, the skin-wash solution containing aluminum acetotartrate (Alsol) did not eradicate all MRSA after 20 min incubation time, which is remarkably long, indicating that it is not an efficient disinfectant. All the tested fluids were surprisingly effective with regard to inactivation of keratinocytes, observed already after 1–2 min. This could indicate a prominent effect on keratinocytes when applying conventional disinfection fluids in vivo, if applied in such a way that keratinocytes are directly exposed. Blue light with riboflavin can, in a fluid layer of 1.2 mm, effectively eradicate MRSA and inactivate human keratinocytes. In the absence of a photosensitizer, 450 nm light can also eliminate bacteria without loss of skin cell viability. A high dose of blue light may possibly be used to inactivate bacteria without the identical effect in human cells in sterilization of bacteria in biofilms, on tissue mucus membranes, and superficial skin wounds. Photodynamic therapy, through riboflavin excitation by blue light, may perhaps also be useful for conditions associated with hyperproliferative keratinocytes, such as psoriasis and atopic dermatitis. Future studies are needed to investigate these findings before in vivo applicability is possible. Many thanks to Professor Ray Goodrich, Colorado State University, and Terumo BCT for supplying the 450-nm prototype lamp and some of the riboflavin solutions used in the experiments. Thanks also to medical student Annam Cheema for helping with some of the control experiments. The work was funded by Örebro University and Örebro University Hospital (Sweden) Research Funds, D-number 461291. All cells used in experiments were commercial reference strains, MRSA (ATCC 43300) and keratinocytes (HaCat 300493, Cell Lines Service (CLS) GmbH, Eppelheim, Germany). Hence, no requirement for ethical approval was needed.